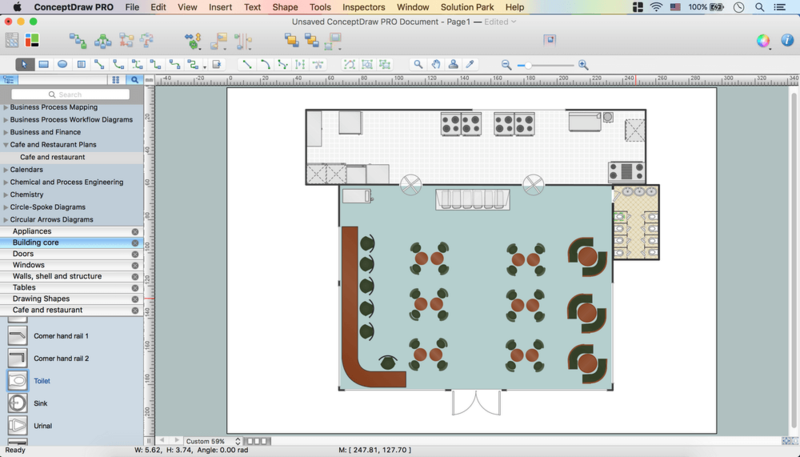 ConceptDraw is a best Design software for the drawing Café Floor plans. 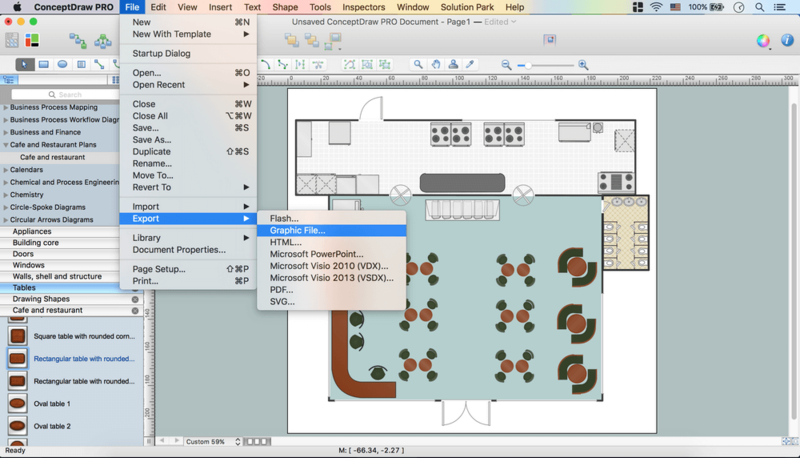 ConceptDraw has 1493 vector stencils in the 49 libraries that helps you to start using software for designing Café Floor plans. Use them to develop the schematics of the furniture layout of the café hall. 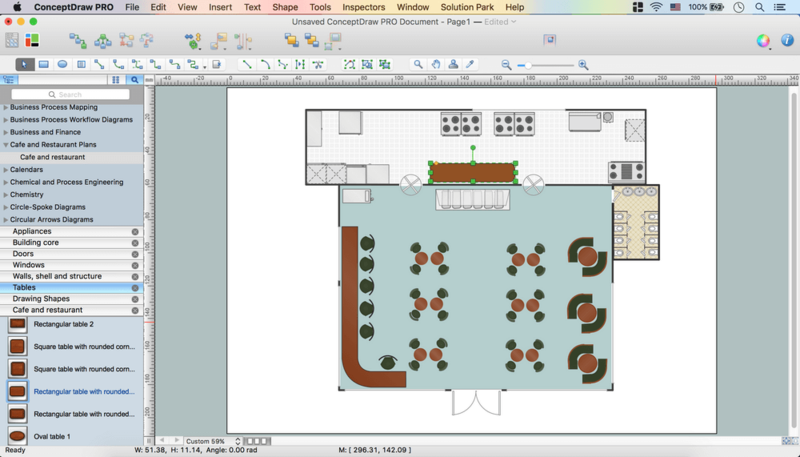 This example was created in the ConceptDraw DIAGRAM diagramming and vector drawing software enhanced with Cafe and Restaurant Plans solution from ConceptDraw DIAGRAM Solution Park. 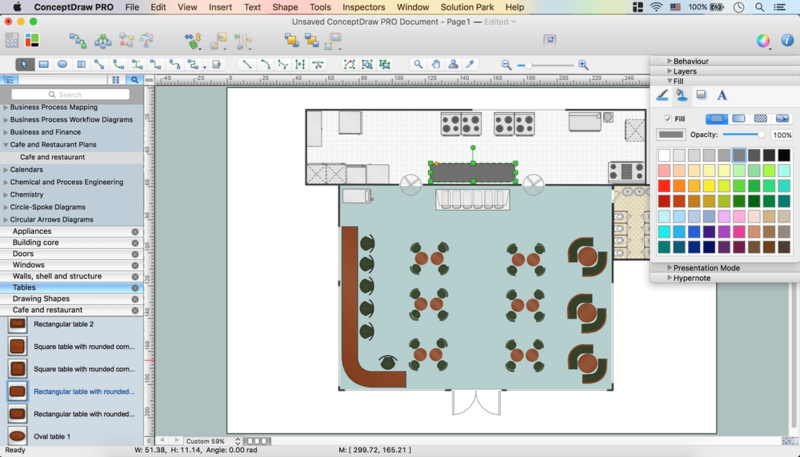 Use ConceptDraw DIAGRAM with Cafe and Restaurant Plans solution to draw your own cafe and restaurant floor plans. 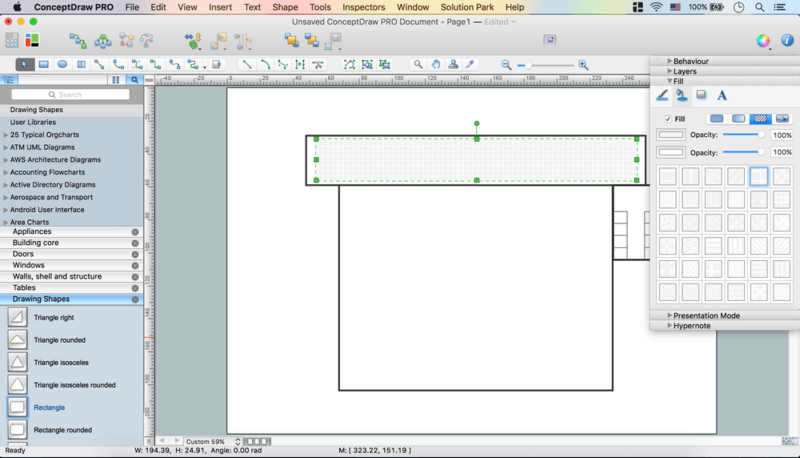 Open Layers Tab in Inspectors. 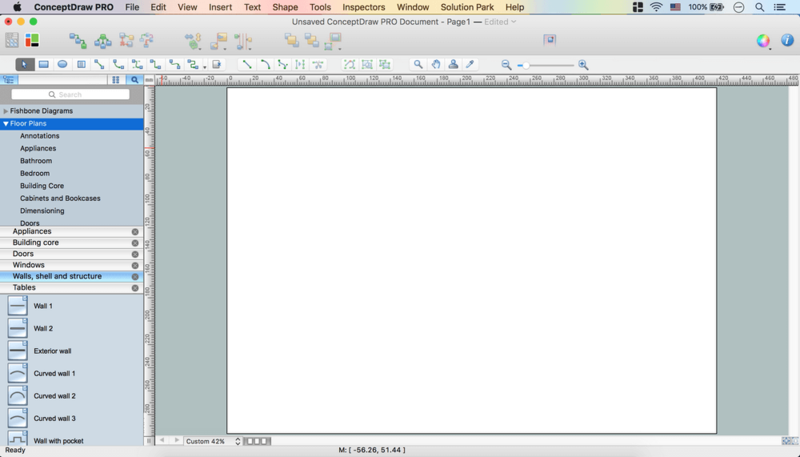 Double click on the layer – Change name. Take T-Room object from the library. Place it on the page. 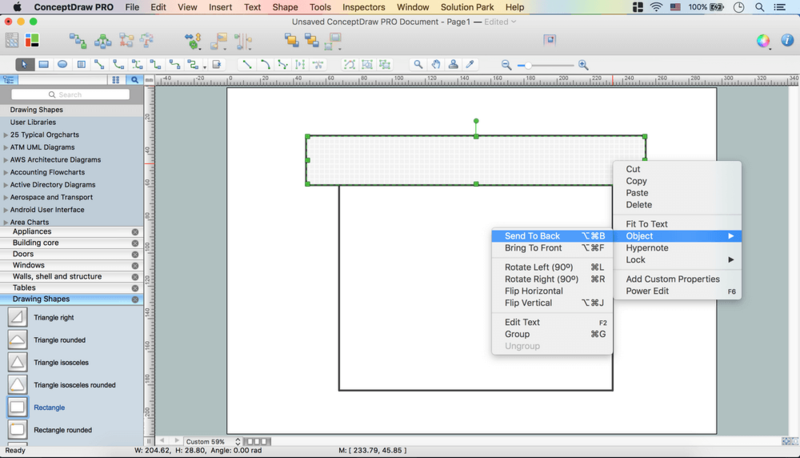 Use control dots to make needed size. 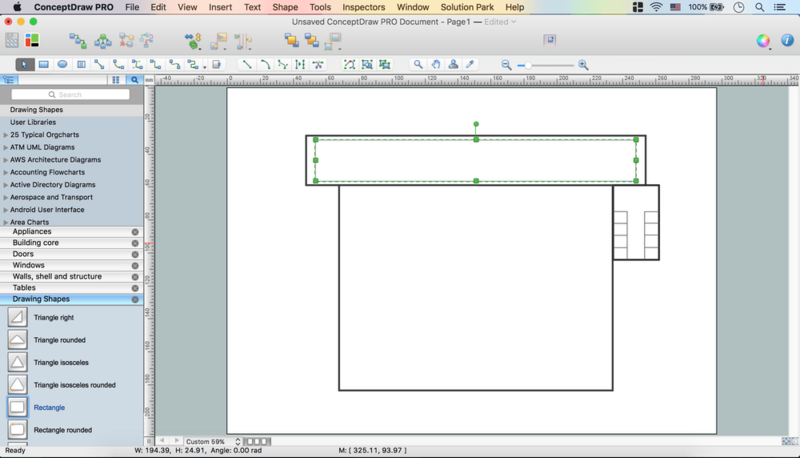 Change Wall Thickness: Right click on the object – Custom Properties. Select Wall Thickness. Change Type to String. Change Value. Add needed Quantity of rooms using Walls, shell and structure library. 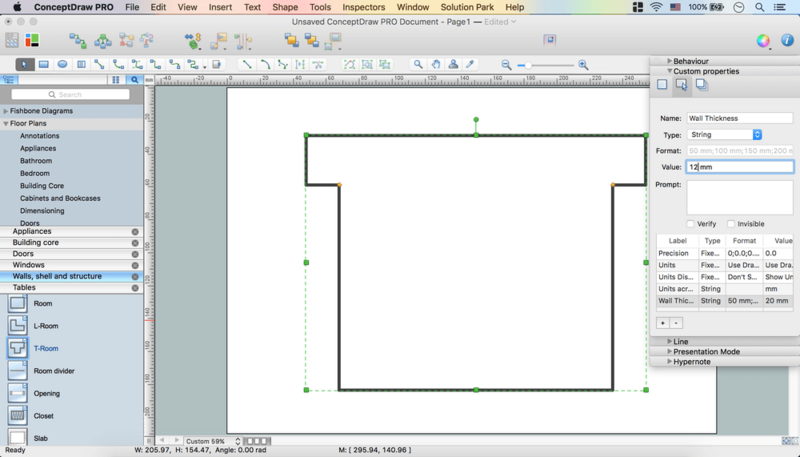 Open Drawing Shapes library from Libraries Panel. Take Rectangle object, place it on the page. 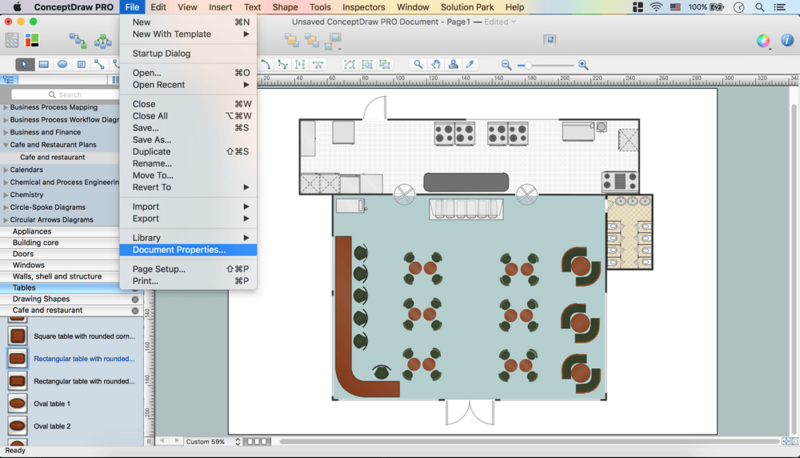 Fill tab – Patterns panel – Select Pattern – Change colors. Using control dots make needed size. 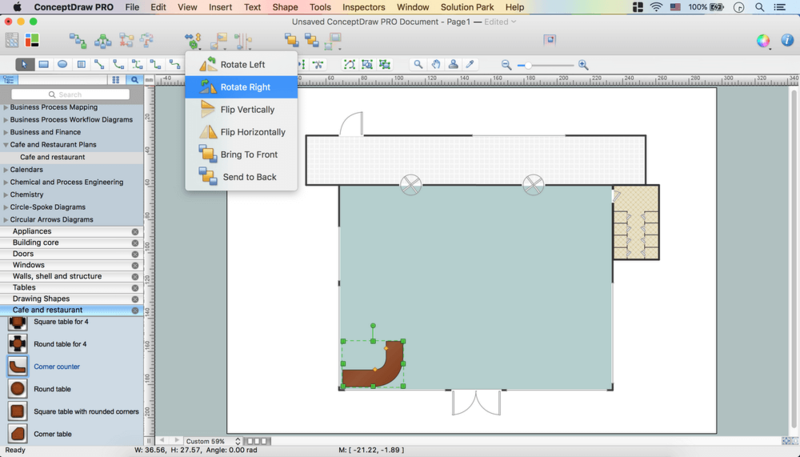 Right click on the object – Object – Send to back or use Send to Back button from the Toolbar. Make backgrounds same way for all rooms. 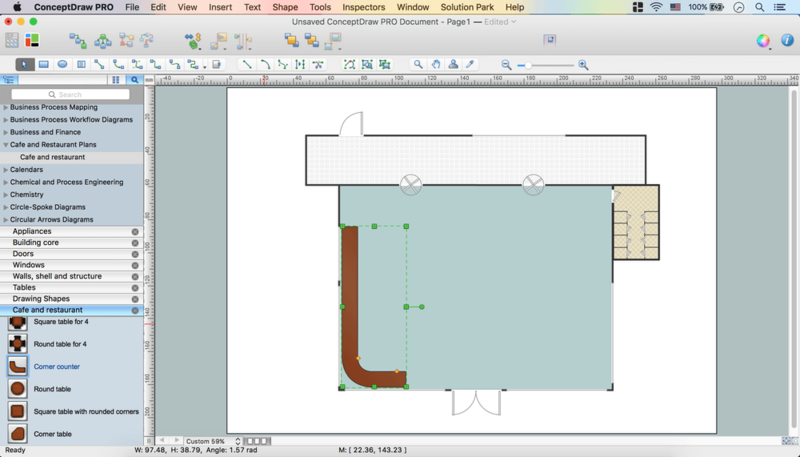 Inspectors – Layers tab - Select another layer for the next part of the drawing. Open Doors library, take needed objects. Place them on the floor plan. 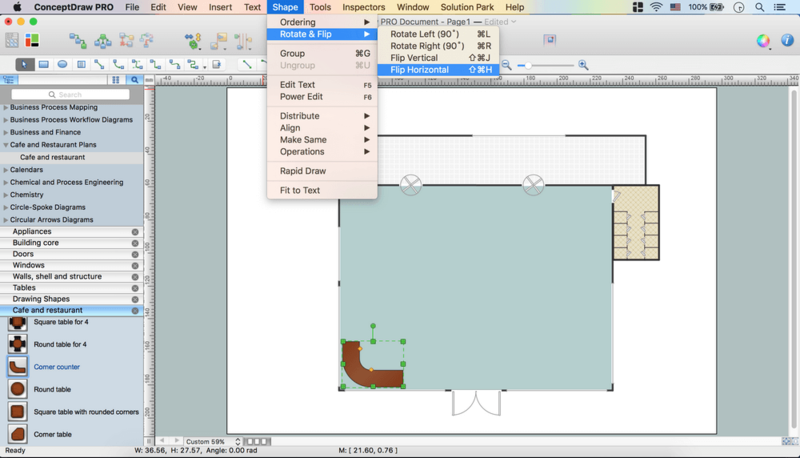 Select all Door objects – Inspectors – Line tab – Change color. Open Windows library, take needed objects. 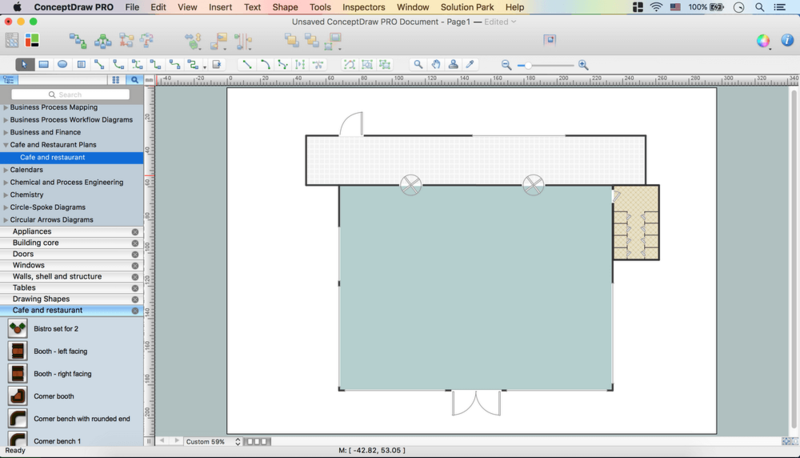 Place them on the floor plan. 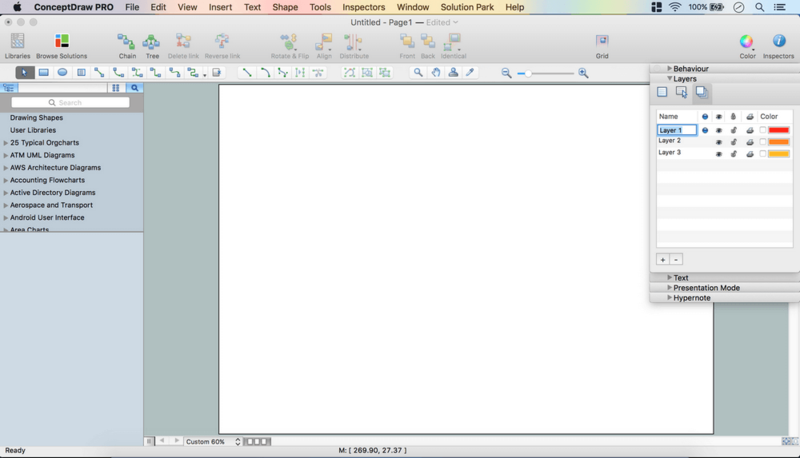 Select all Windows objects – Inspectors – Line tab – Change color. Open Café and restaurant library from Libraries Panel. Take Corner counter object. 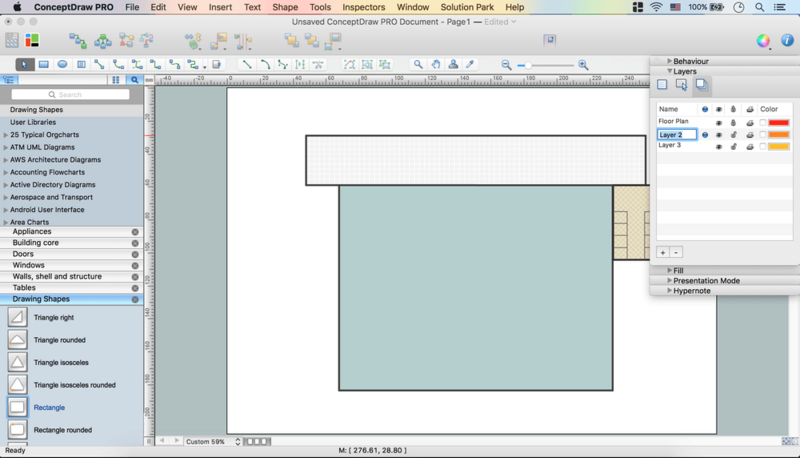 Place it on the floor plan. 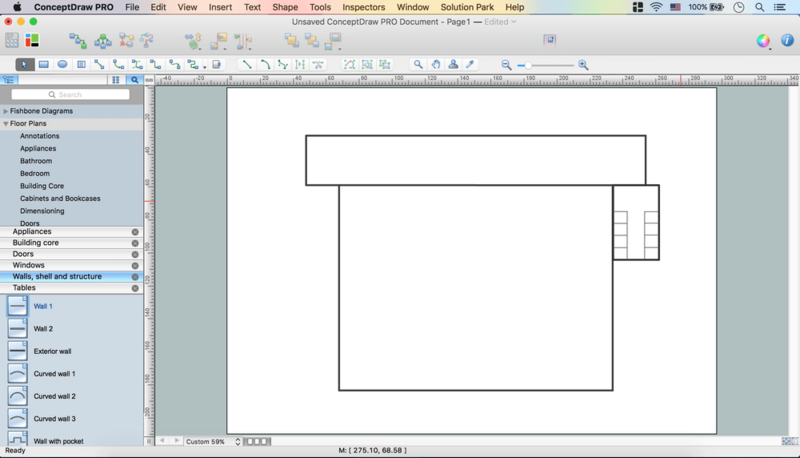 Flip it horizontal via Shape Menu – Rotate & Flip or using Rotate & Flip option from the Toolbar. 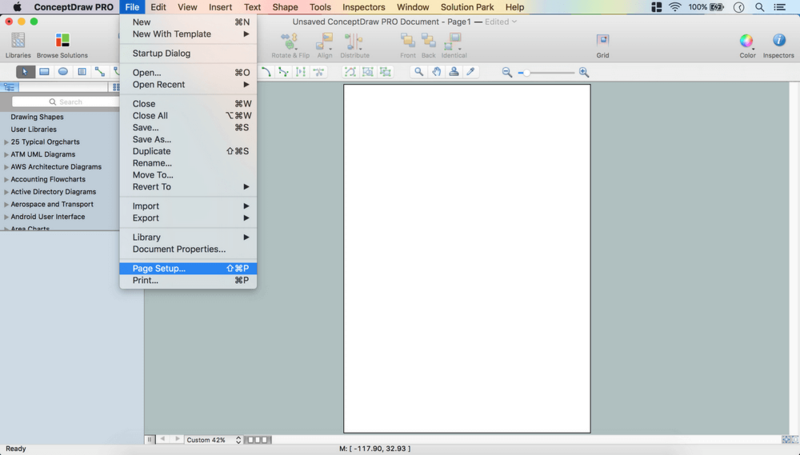 Rotate it Right via Shape Menu – Rotate & Flip or using Rotate & Flip option from the Toolbar. Using Control dots and Yellow diamonds you may set size of the object. 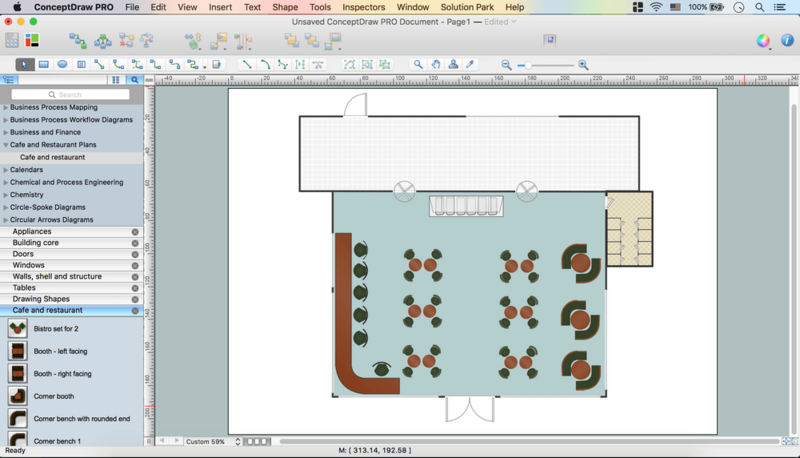 Take needed object from Café and restaurant library, place them on the floor plan. Open Appliances library, take needed objects. 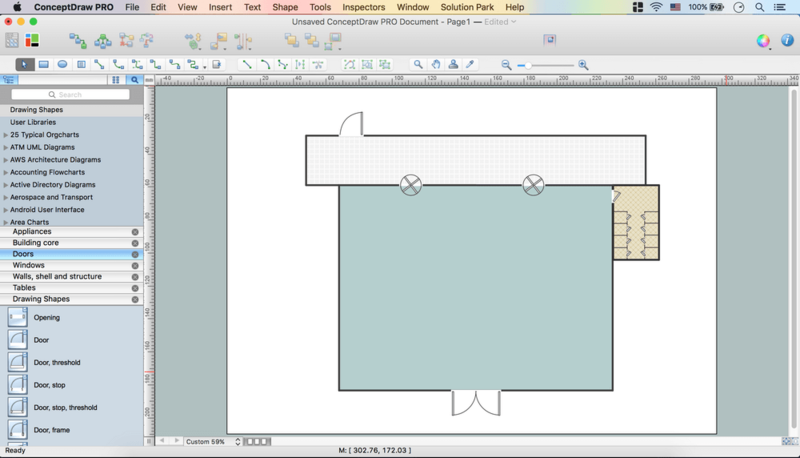 Place them on the floor plan. Open Building Core library, take needed objects. 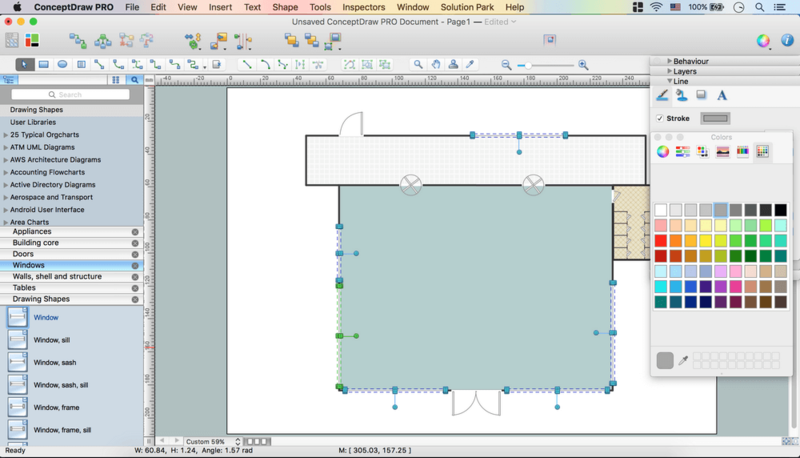 Place them on the floor plan. 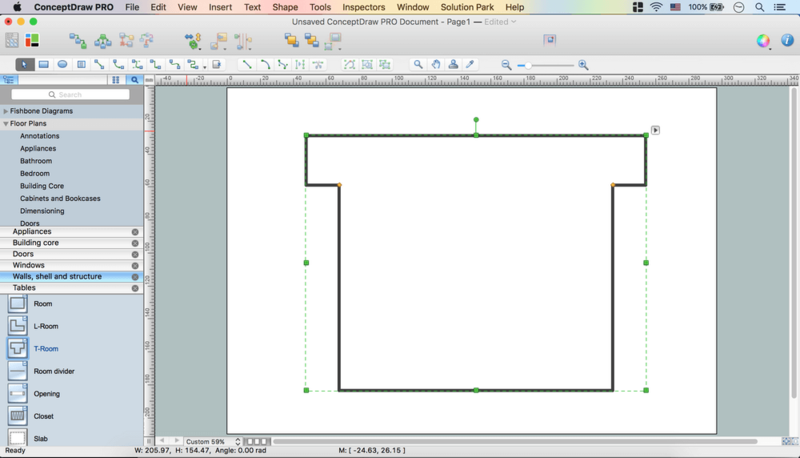 From Tables library take Rectangular Table with Rounded Corners 1 object. Place it on the Floor Plan.